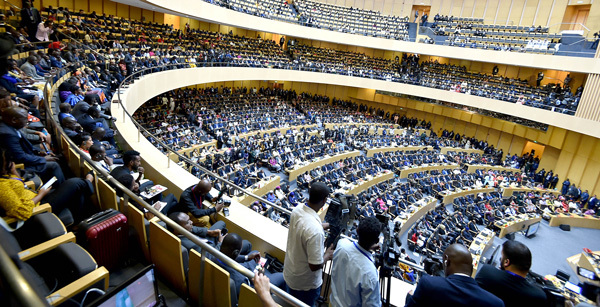 Addis Ababa — The 32nd African Union summit of heads of state kicked off on Sunday in Ethiopia’s capital Addis Ababa, to primarily deliberate on pressing issues of the continent such as forced displacement as well as peace and security, among others. Under the main theme, “Refugees, Returnees and internally displaced persons (IDPs): Towards Durable Solutions to Forced displacement in Africa,” the two-day session of the AU heads of state also deliberates on issues related to the ongoing AU institutional reform and continental free trade area among other continental projects and initiatives. Speaking on the occasion, Sisi called for efforts to promote peace and security as well as solidarity with refugees, migrants and internally displaced persons. Caption: 32nd Ordinary Session of the Assembly of Heads of State and Government of the African Union. The Assembly takes place from 10-11 February 2019 under the theme: “The Year of Refugees, Returnees and International Displaced Persons: Towards Durable Solutions to Forced Displacement in Africa”. It presents an invaluable opportunity to reflect on and address the root causes of forced displacement in Africa. 10/02/2019 Photograph by Kopano Tlape GCIS.